Global use of mobile devices has exploded in recent years, driven by society’s need for anytime, anywhere services at the touch of a button. Yet, privacy concerns over access to ubiquitous data remain a concern in adopting this technology. With the right mobile platform, users can enjoy a myriad of conveniences in their daily lives from personal home security alerts to “smart” appliances to real-time traffic information, without compromising privacy by giving users control of the information they share. Dr. Khalid Elgazzar, a Canada Research Chair in the Internet of Things (IoT) and Associate Professor in the Faculty of Engineering and Applied Science is developing cutting-edge methods to advance wireless technologies that will ensure the seamless interaction of smart services across critical areas such as health care, transportation, emergency response and law enforcement, and industrial automation. His CRC research agenda supports the expansion of Internet-enabled computing devices and advancements in wireless technologies. He is examining ways to embed computing devices such as data sensors in physical environments to create “smart spaces” where information can be relayed in real-time to help people live smarter, safer and more productive lives. His research also includes the development of a robust authorization control system to protect users’ privacy. The technology in embedded computing devices such as sensors can revolutionize the way people carry out everyday tasks, something society is becoming increasingly reliant on in everyday life. Previously, Dr. Elgazzar was an Assistant Professor at the Center of Advanced Computer Studies at the University of Louisiana at Lafayette, and is an Adjunct Assistant Professor with the School of Computing at Queen’s University in Kingston, Ontario, where he has lectured; along with Carnegie Mellon University in Pittsburgh, Pennsylvania, and the Arab Academy for Science and Technology in Alexandria, Egypt. Dr. Elgazzar holds a PhD in Computer Science from Queen’s University. He earned a Master of Computer Engineering and a Bachelor of Engineering in Computer and Communication Engineering from Alexandria University in Egypt. Recognizing the of future technology, his keen interest in computer networking and model computing evolved into the idea of using mobile devices as a platform for people to not only access information online, but use it to improve efficiencies in their daily lives. During his one-year postdoctoral research role, Dr. Elgazzar led the eﬀort to create core infrastructure support for an open and integrated IoT stack with innovations at the hardware, software and end-user levels (known as GIoTTO). GIoTTO provides a rich tool set and reconﬁgurable testbed for developers and researchers to build an IoT ecology system. Dr. Elgazzar is leading a team to develop a general purpose mobile sensing platform that oﬀers sensing as a service on demand for IoT scenarios. The platform provides mechanisms to abstract low-level sensing functionality from both the underlaying infrastructure and application-level demands to enable high ﬂexibility. Dr. Elgazzar received this award for his paper entitled: Empowering Mobile Service Provisioning Through Cloud Assistance in the conference held in Dresden, Germany. Dr. Elgazzar’s five-year CRC research program involves the development of “smart” spaces using embedded sensors to provide personalized services in a variety of environments that will enable people to conduct personal and professional tasks on the go while maintaining data privacy. 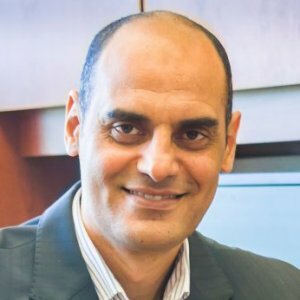 As principal investigator of this five-year research project, Dr. Elgazzar aims to develop a smart city environment by deploying cameras on intersections that will feed real-time video streams into campus systems, in order to analyze and determine whether an event of interest such as a traffic violation or accident is occurring. In collaboration with the City of Oshawa, the infrastructure for this project will be built on UOIT’s campus. As co-investigator of this one-year research project, Dr. Elgazzar is developing an app for mobile devices and emergency vehicle dash cams that can crowdsource, register and stream public data and video of real-time events into a command centre to be assessed for immediate action by emergency response operators. In collaboration with the University of Louisiana at Lafayette, Iowa State University and BYU Iowa University, Dr. Elgazzar is a co-investigator on this four-year research project aimed at developing an online learning platform to enable hydrology students to visualize data and understand prediction models related to rainfall, flooding or weather forecasting. As the principal investigator of this three-year research project, Dr. Elgazzar is focused on the privacy and protection of data that is stored in sensors or personal devices such as pacemakers in an open environment. He is currently developing a privacy preservation access technique that would enable only the user and an authorized entity to access the data and sensors in their proximity. Constrained resource (lossy) networks are characterized by low-power and low-processing capability devices. Using lossy networks for service provision is a good approach to overcoming the technological constraints that characterize remote and rural areas of developing regions. In this chapter, we propose a framework for provisioning Healthcare-as-a-mobile-service over lossy networks, as a cost-effective approach to healthcare management in remote and rural areas of developing regions. Ubiquitous information access through mobile devices has become a typical practice in everyday life. The mobile service paradigm shifts the role of mobile devices from consumers to providers, opening up new opportunities for a multitude of collaborative services and applications ranging from sharing personal information to collaborative participatory sensing. Although many basic principles of the standard Web service approach continue to apply, the inherent constraints of mobile devices and broadband wireless access render the deployment of the standard architecture in mobile environments inefficient. This paper introduced personal services, a user-centric paradigm that enables service-oriented interactions among mobile devices that are controlled via user-specified authorization policies. The widespread use and increasing capabilities of mobiles devices are making them a viable platform for offering mobile services. However, the increasing resource demands of mobile services and the inherent constraints of mobile devices limit the quality and type of functionality that can be offered, preventing mobile devices from exploiting their full potential as reliable service providers. Computation offloading offers mobile devices the opportunity to transfer resource-intensive computations to more resourceful computing infrastructures. We present a framework for cloud-assisted mobile service provisioning to assist mobile devices in delivering reliable services. The framework supports dynamic offloading based on the resource status of mobile systems and current network conditions, while satisfying the user-defined energy constraints. It also enables the mobile provider to delegate the cloud infrastructure to forward the service response directly to the user when no further processing is required by the provider. The proliferation of smartphones and the recent advancement in ubiquitous wireless access have made mobile Web services more possible than ever before. However, finding relevant Web services that can match requests and fit user context remains a major concern. The challenges facing Web service discovery are further magnified by the stringent constraints of mobile devices and the inherit complexity of wireless heterogeneous networks. Cloud computing, with its flexible design and theoretically unlimited computing resources, is a viable approach to bootstrapping Web service discovery. The cloud can build bridges between mobile devices, as a convenient ubiquitous interface, and a backbone infrastructure with abundant computing resources. This paper introduces “Discovery as a service (Daas)”, a novel cloud-based discovery framework that addresses the core components of mobile Web service discovery. Peer-to-peer (P2P) systems present a unique medium for resource sharing among cliques of participants (peers) in a distributed and self-organized manner. With the advent of mobile users and the increasing power of mobile devices, the spectrum of P2P capabilities should scale. Peers establish transient or persistent relationships with other peers based on mutual interest. Communicating peers may use intermediary peers to forward communication messages, if a direct link is beyond their communication range. A critical design parameter is establishing a resilient communication topology, yet reduce the overhead of control messages required to instill and maintain it. This rises as a significant hindrance in mobile environments, which pose additional challenges on P2P networks due to the heterogeneity of nodes, limited resources, dynamic contexts in addition to the inherited wireless network stringencies. Thus far, efforts in establishing P2P networks via super peers (SPs) have been capped by considering a subset of peer properties to evaluate their candidacy. This paper presents RobP2P, a robust architecture to construct mobile P2P networks and efficiently maintain network state. For many years mobile devices were commonly recognized as Web consumers. However, the advancements in mobile device manufacturing, coupled with the latest achievements in wireless communication developments are both key enablers for shifting the role of mobile devices from service consumers to service providers. This paradigm shift is a major step towards the realization of pervasive and ubiquitous computing. Mobile Web service provisioning is the art of hosting and offering Web services from mobile devices, which actively contributes towards the direction of Mobile Internet. In this paper, we provide the state of the art of mobile service provisioning as it currently stands. We focus our discussions on its applicability, reliability, and challenges of mobile environments and resource constraints. We study the different provisioning architectures, enabler technologies, publishing and discovery mechanisms, and maintenance of up-to-date service registries. We point out the major open research issues in each provisioning aspect. Performance issues due to the resource constraints of mobile devices are also discussed. With the huge number of offerings in the mobile application market, the choice of mobile applications that best fit particular objectives is challenging. Therefore, there is a demand for a platform elevating the momentum of mobile applications that can adapt their behavior according to the user’s context. This paper proposes AppaaS, a context-aware platform that provides mobile applications as a service. AppaaS uses several types of context information including location information, user profile, device profile, user ratings, and time to provision the best relevant mobile applications to such a context.